Floyd Presbyterian Church is a historic Presbyterian church located on U.S. 221 in Floyd, Floyd County, Virginia. It was built in 1850, and is a one-story, three bay, brick church in the Greek Revival style. It has a front gable roof topped by a low steeple and octagonal spire. The front facade features four white-painted stuccoed, Greek Doric order pilasters. The church was abandoned by its congregation in October, 1974, and the congregation relocated. It was listed on the National Register of Historic Places in 1976. It is located in the Floyd Historic District. This article about a property in Floyd County, Virginia on the National Register of Historic Places is a stub. You can help Wikipedia by expanding it. 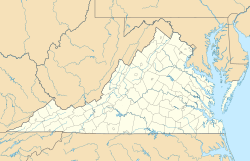 This article about a church or other Christian place of worship in Virginia is a stub. You can help Wikipedia by expanding it. This page was last edited on 30 December 2017, at 20:31 (UTC).